The purpose of this post is to make an initial analysis of structure of Recoil Control. Remember that the challenge is to formulate a model to simulate Recoil Control in simulators. But walking the road we will learn something about Recoil Control pattern. The pitch and yaw (vertical and horizontal angle) referred to the line of aiming every 10 milliseconds in a 26-round burst of ACE-52 (recoil up = 0.560; FSM = 1,950; Recoil H +/- 0.300) has been recorded. This is a high recoil weapon. Five bursts have been recorded, one without control and four with recoil controlled, aiming at a recognizable target. The player who took the test, which we will call SPECIMEN 0, is a skilled player (percentile 87%, SKILL = 371, SPM = 997, K/D = 1.4). He can be representative of the high fraction of players (if he is not, I'm sorry, I have no other ). At the moment the results are only valid for this player and this weapon. Horizontal axe is always in miliseconds. Note that weapon reachs the maximun Recoil Up. Since we are not going to work (for the moment) with the horizontal recoil, I just want to say that there seems to be a certain correlation between large corrections of horizontal recoil (when it has accumulated excessively) with a great vertical correction. The dotted line is the difference between non-control and control and provides the reaction time after the first shot (not necessarily since the mouse button is pressed because there is a technological delay to the shot). 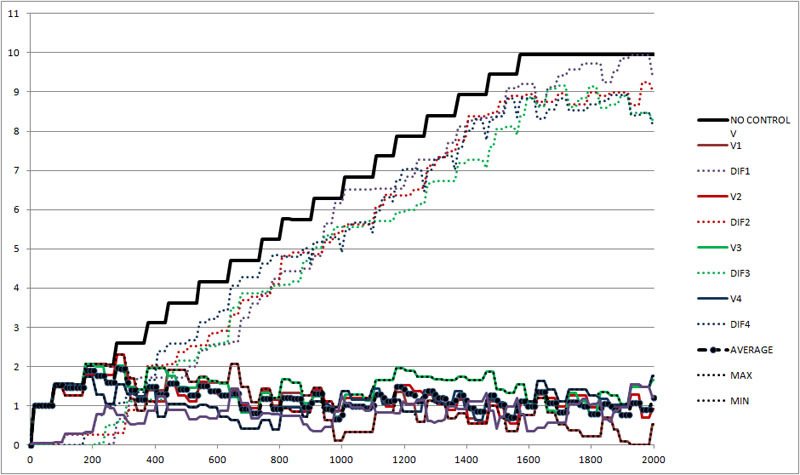 Some irregularities (time between shots) should be due to sampling and tickrate asynchrony. 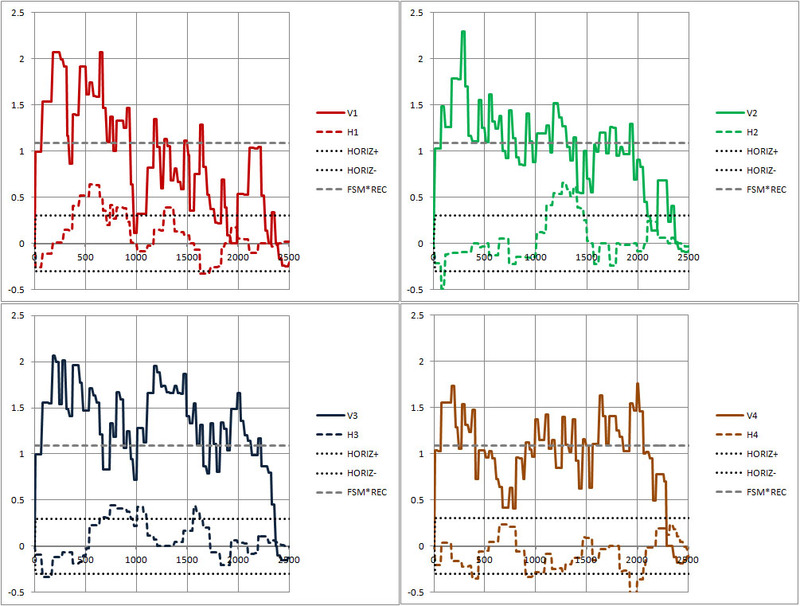 The small vertical differences are due to the small randomness of Recoil Up (0.95 +/- 0.05). The average reaction time after firts shot is 195 miliseconds (max=267; min=100). The corrections happen after three bullets in three bursts and after two bullets in one burts. You can see that there are two types of corrections: ones in the range of Recoil Up and others of the order of double that value. My hypothesis is the major may be a joint corrections of recoil up and horizontal recoil (to be confirmed). That is to say a regular rhythm of correction adapted to recoil up and some exceptional for general correction. 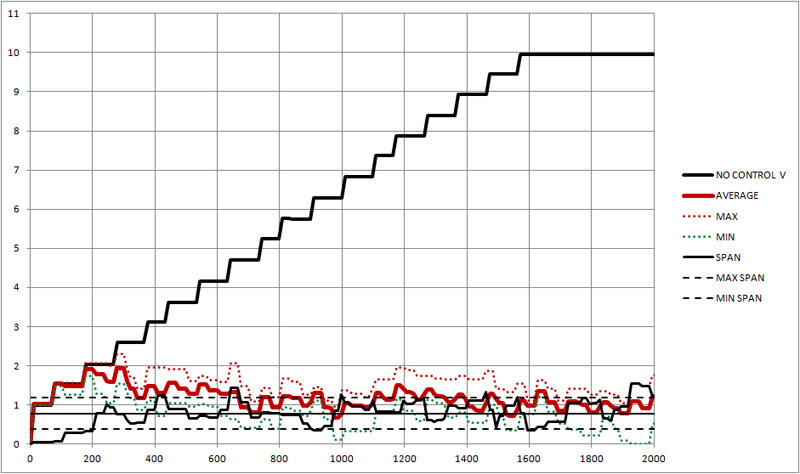 More clearly it is shown in this graph that also includes the span (maximum-minimum) of the positions of the barrel in black line, referred to the axes (not superimposed to the average line). It can be seen that after the third bullet there is an adaptation and that the average line stabilizes with a height of one degree above the point of aiming +/- 0.8 degrees of span. 1.- A deterministic model: The vertical position of barrel follows the solid red line. 2.- A probabilistic method: The barrel has a random vertical position between de firts dotted lines with an uniform distribution. 3.- A more complex model: The barrel has a random possition between the more distant lines (++,--) with a model biased to center. 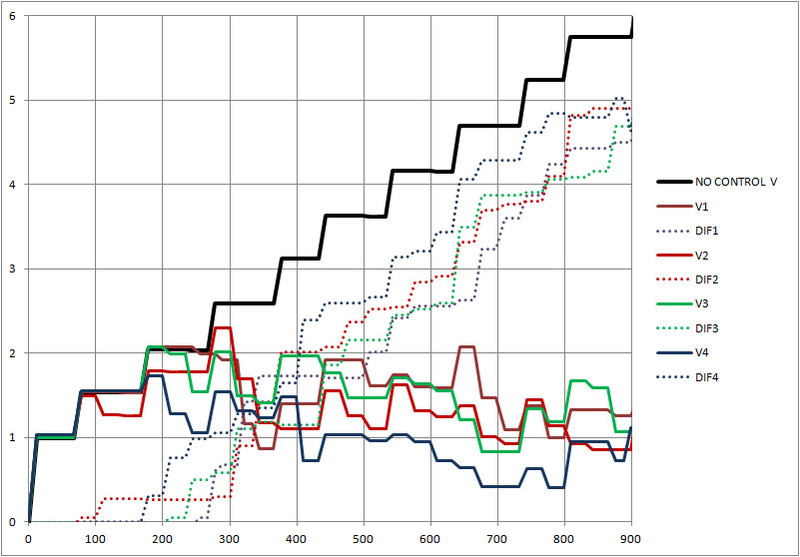 A small sensitivity analysis will inform if a complex method in the simulation is profitable. For the horizontal recoil we can admit that it is corrected when it exceeds a maximum value that we can set conventionally in the Max Recoil H (firts approach). 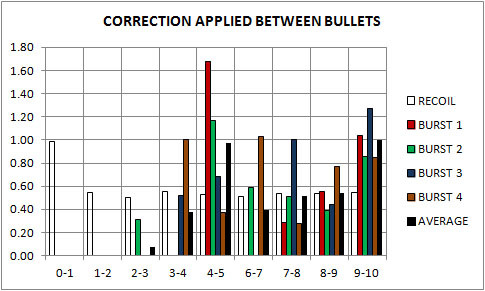 1.- The three firts bullets are not corrected. 3.- The circle of accuracy (position of the barrel around the stabilized level) has a size in the range of 0.8 degree. 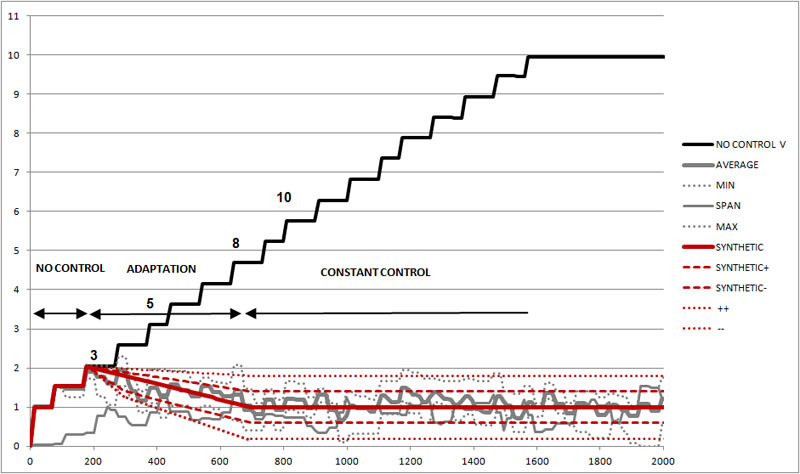 4.- A initial adaptation (not complete) is made after three bullets and before stabilization. 5.- The repetitive Recoil Up can be controlled with a remainig displacement derivated of the firts bullets uncontrolled. 6.- It seems there are two types of corrections: regular and exceptional (perhaps in combination with a horizontal recoil correction). Additional: Surprisingly many of the intuitions extracted from the rough method "shoot to the wall" are valid !!!! Much work is nedeed to convert particular into general conclusions. vRecoil is 0.95 +- 0.05. Range is therefore from 0.90 to 1.00. Well pointed. Thanks!!!. I edit that. The two of you have such similar profile pictures, except one looks like a hero and the other looks like a villain. By the way, is that Skill of 371 really only the 87th percentile? I remember getting into the first division with a Skill of lower than 350 a while back. Given the effective number of bullets per bursts is 3-5 or so, especially in BF1, sounds like people won't be controlling recoil too much per shot. Although it would be interesting to see how a pro-ish (top 0.1%) player controls their recoil with a familiar gun and not-so-familiar gun. But should probably wait till final reports before drawing too many conclusions . so specimen 0 has less or more my same stats and is considered a "skilled player" by one of th emost helpful user of the community? well that definitely makes me feelmore confident about myself then. 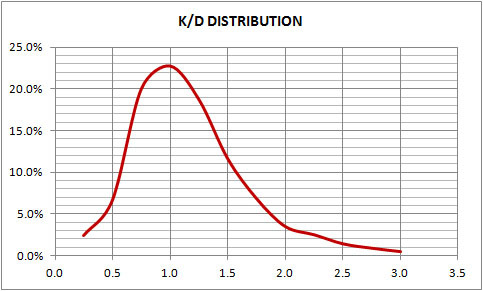 Personally, I expect the median K/D ratio for "Battlefield" players in general to be under 1 since the good players have K/D ratios far above that number with perhaps 3 or 4 kills for every death. Anyone that dies fewer times than they get kills is most likely doing quite well already. 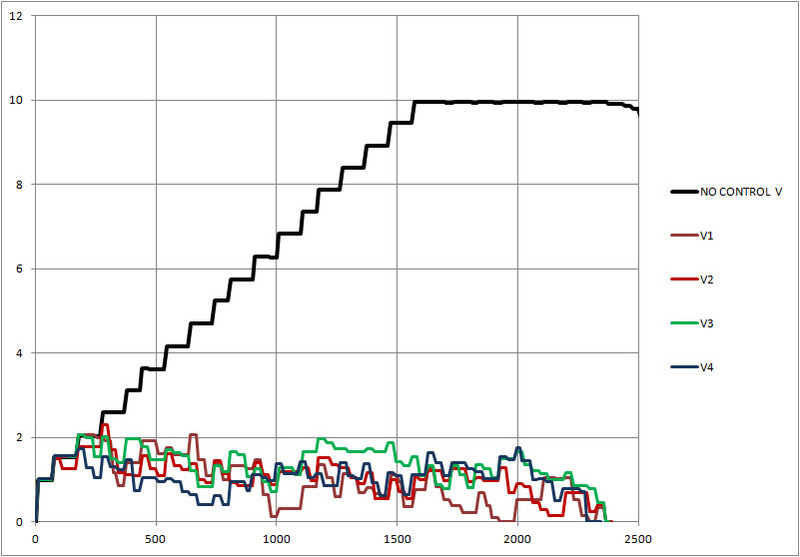 I made this graph with BFSTATS data some time ago (I have graphs for everything ). Median was 1.14. The median is not affected by the heaviest weight of a player with high K / D. Only separates in two equal parts in number the population. In fact it is the 50% percentile. The reasoning that a player with high K / D "weighs" more than one low K/D affects the mean value that in this case was something like 1.2 or 1.3 (I quote from memory). Does that website actually track all those stats automatically ? Not automatically. You have to extract the data manually o by scraping and make the graph.